I knew a similar lineup had done some gigs around this time, but I'd never heard of any recordings. This is exciting, thanks. BTW when I saw Daevid Allen and Yochko Seffer at the Manifestival in LA in '79, Laswell and company were the backup band. They did their own set of minimalist funk, but were known only as the Zu Band. The highlight of their set as I recall, was a cover of Sombre Reptiles. This is fascinating. The first part serves as something of a demo for John Greaves' Accident album, which wasn't released until 1982. Then comes an early instrumental version of what eventually became Crumb de la Crumb. It's interesting that these tunes were already written (or at least works in progress) in 1978. I pulled out the one sided clear vinyl 7" that includes Frenzy, and it also was not released until 1982. Glad to be of service. Big Guns was the name of a downtown Blegvad band with Laswell and Fier. Greaves is a great composer and I wish I had more of his 'solo' stuff. I've got Songs, which I like very much. Yes, I remember that name, The Big Guns. That's the one that shows up on Downtime as Crumb De La Crumb. Accident, like its follow up, Parrot Fashions, has great Greaves/Blegvad tunes and peculiar '80s production values. I had Accident many years ago and got rid of it. Can't recall or imagine what could have pushed me to reject one collaboration out of so many. I guess I am fairly allergic to what a lot of the 80s sounded like, though. It's an honor to hear from you. I use Zipeg, which should be free and easy. If this doesn't work, let me know and I'll figure something else out. We all talked about the name, and went with Giorgio's idea of "Zu"--not everyone was crazy about that: it was based on the Zu bird, a mythological phoenix-like creature." Gidouille: it was the coming together of Giorgio, his loft space on 24th Street, and his idea for a great festival, that created the context for locating the band members that became Material: that name evolved shortly after the festival. Bill Laswell was in contact with Cliff Cultreri (then manager of Pantasia Record store), and (as I recall) he had been in touch with Michael and Fred. More on Zu and Giorgio's place some other time. As for this evening at Giorgio's loft space, I've thought of it many, many times because it was so remarkable. I was then Bill Laswell's girlfriend and helped him with booking and promoting the band, after the festival, after which Frith stayed in town. 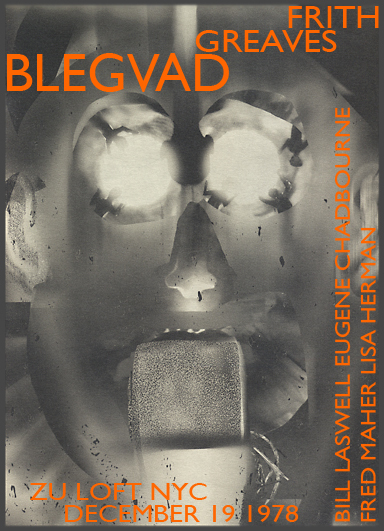 Blegvad was then living in Manhattan. Then...Greaves came to town for awhile, and as a result this evening came together. A couple of things to note, aside from the fact that I had a bit of a crush on Greaves. In addition to Lisa Herman there was another woman singing (mostly backup vocals; Peter and John sang most of the songs with a vocal track). On one of them, (Greaves was singer), Fred played the most lyrical, melodic, short lead guitar part I've ever heard. I only heard it a few times (rehearsals and the performance), and to this day (35 years later) I can still hear parts of the lead line. It was robust and pungent, like Fripp, whom Fred hadn't even heard at the time, but beautifully elegiac. At the time, all I'd heard Fred play was experimental guitar--rice thrown on the guitar, bowing the guitar, etc--so I was totally blown away by this short, blistering, poetic burst of melodic lead from him. I'll never forget it. I would.do.anything to have a video or sound recording of this evening. It was unforgettable. I was just telling a local friend here in Austin, TX about this yesterday, which is what prompted me to look for a video of it online, thinking that by now, someone would have posted something about it. Btw, the song that included this solo part by Fred had something do with number, and a code and a message from a woman: it was a broken-hearted song of loss, and Greaves was an amazing singer. Blegvad's songs were darkly-comic and ironic. It's been a long, long time. Thanks for sharing this. Who knew that Peter Blegvad and friends would be so popular with entrepreneurs attempting to sell all sorts of inappropriate goodies to unsuspecting music fans?? the zu band & the u.s. gong band (that performed at the original zu fest in '78 were 2 entirely diff bands. zu, with cliff, went on to become material. they WERE meant to be daevid's american band, that is until a mutual artist/friend, dorian lapadura, on mine & beinie's invited me to come down the the zu house, just to help out (& get to see the show for free). as it turned out, las, beinie & maher were rehearsing downstairs, & following the sound, i found myself face to face with cliff's tele sittin' upright in a chair, the man himself absent on the day (sick, if mem serves). the guys asked if i'd like to sit in, & that was it; i was asked to join, replacing cliff (i could play a LOT like hillage, & i knew the toons even better than they did; chris, of course, set us ALL straight when he & daeve arrived from overseas; big DOH moment), on the spot, cliff maintaining his zu guitar chair. this is the ENTIRE list, anyone else listed (on too many sites) as a band member was invented, myth. i keep seeing this guy dennis weise listed as bein' another synth player in the lineup, & though it's possible he might have played with the zu band (material), i personally don't even remember the guy, & he did NOT play with us in gong. neither did cliff, who was actually VERY sweet when the guys asked me to take over for him in gong. Thanks for the inside information, Muddy. As the misguided entrepreneur says in the comment following yours, "The matter that you provide is worth our time and energy." Adding, "An immense moonlike of commendation, reserve it up." I'm still trying to figure out why this post attracts hopeless misguided sales pitches. Taking 'loft' out of the title seemed to help for awhile, but the predators have adapted and evolved. Curses!